In a bid to take affirmative action over unabated pollution of river Ganga, the Uttarakhand High Court issued a set of mandatory directives to be carried out by Central and state authorities. Among others, the high court directed a special audit to be done by the Comptroller and Auditor General (CAG) of all Centrally-financed schemes to check alleged misuse of funds. Lalit Miglani, an advocate in the high court, had filed a PIL highlighting the pollution of river Ganga and alleged negligence of the authorities in discharge of their statutory duties. The court further observed that despite the fact that billions of rupees have been spent for restoration of quality of water of river Ganga, the quality of its water ‘instead of being restored as per the norms, has further deteriorated’. The bench urged the people to ‘change rituals with passage of time’ to restore the purity of the water for future generations. The need for a ‘comprehensive legislation at the national level dealing with the Ganga alone’ was highlighted in the face of proven inadequacy of current legislations and their inefficient implementation. The Union of India is directed to establish the inter-state council under Article 263 of the Constitution of India for all the riparian states through which river Ganga flows i.e. Uttarakhand, Uttar Pradesh, Jharkhand, Bihar and West Bengal, within three months from today, for making recommendations to the Central Government in order to clean/rejuvenate river Ganga on the analogy of the National Water Development Agency as well as Water Resources Development Council. The inter-state council shall make recommendations to the Central Government, within a period of three months after its constitution, to the Central Government. The Central Government shall consider the same within a further period of three months and take necessary measures to restore river Ganga to its pristine glory. Director, National Mission for Clean Ganga is directed to accord sanction of Rs.266.09 crores, as per the DPR sent to it by the State Programme Management Group (SPMG), within a period of six weeks from today. The funds shall be used exclusively by the Uttarkhand Peyjal Nigam for interception and diversion of leftover drains for existing Sewage Treatment Plants (STPs), new STPs and other effluent works at Haridwar. The State Government is directed to enhance the capacity of Sewage Treatment Plants at Haridwar and Rishikesh, within a period of three months from today, taking into consideration the sewage load in these two towns. Bharat Heavy Electricals Ltd. (BHEL) is directed to install Sewage Treatment Plant of having capacity of 11 MLD, as per the direction issued by respondent no.2-Uttarakhand Environment Protection & Pollution Control Board on 21.12.2015, within six months from today, if not already installed. All the 21 Hydroelectric Projects located in the mainstream of River Ganga are hereby directed to install Sewage Treatment Plants of appropriate capacity during construction phase and thereafter, at operational phases, within a period of six months from today. Director, National Mission for Clean Ganga, is directed to install the Sewage Treatment Plant, having capacity of 40 MLD, at Jagjeetpur, sanctioned by it on 29.9.2015, by completing the process within three months from today. Respondent No.2-Uttarakhand Environment Protection & Pollution Control Board is directed to take action against those 180 Industries, to whom the Show cause Notices have been issued in the Year 2015-16 as per Annexure No.4, and to complete the same within three months from today. Industries mentioned at Serial Nos.1 to 44, to whom Closure Notices have already been issued in the Year 2014-15, are hereby ordered to be closed/shut forthwith by the concerned District Magistrate. 106 Industries, to whom Closure Notices have been issued in the Year 2015-16, are also ordered to be closed/shut forthwith by the concerned District Magistrate. The State Government is directed to take appropriate action against the respondent no.2 – State Environment Protection & Pollution Control Board under Section 62 of the Act of 1974 within a period of six months from today, since it has failed to discharge its statutory duties under the State Act. The Union of India is also directed to issue necessary directions to the Board to strictly implement the environmental laws in order to protect and preserve River Ganga and in case, the State Board fails to comply with the directions and a grave emergency arises due to further degradation of water quality in Ganga, the Central Government may order the Central Pollution Board to perform the functions of the State Board in the entire stretch of area covering River Ganga and its other tributaries in the State of Uttarakhand. The competent authorities are also directed to initiate criminal proceedings against the defaulters for contravention of the provisions of Water (Prevention and Control of Pollution) Act, 1974 as well as the Environment (Protection) Act, 1986 within three months. It is made clear that the Ashrams at Haridwar would be ordered to be sealed and closed down by the District Magistrate/Senior Superintendent of Police of the area, where these Ashrams are located, in case the untreated sewage is permitted by them to flow in the Ganga directly without treatment. After three months, no industry/hotel/ commercial establishment/educational institution shall discharge untreated sewage/ industrial effluents in River Ganga without its treatment. In case of failure, the competent authority is directed to take stern action against these commercial establishments. All the drains opening into the river Ganga shall be sealed and closed after three months. The most pollutant units situated on the banks of river Ganga are ordered to be re-located by following the norms laid down by the Their Lordships in the judgments, quoted hereinabove. No person shall litter/defecate/urinate, in open, within a radius of 500 meters on both sides of river Ganga. The State Government is directed to make suitable amendments in the municipal laws by imposing stringent fines including imprisonment. Any person found littering/urinating/defecating in open on the banks of river Ganga, shall be imposed a fine of Rs.5,000. The concerned District Magistrates of the State shall be personally responsible to carry out these directions. The District Magistrates of the concerned district are directed to put up suitable number of Notice Boards on all the Ghats and religious places, falling in their territorial jurisdiction, about these directions. The Sub Divisional Magistrates are permitted to take cognizance of the matter till the municipal laws are suitably amended. Suitable number of Mobile Magistrates shall remain posted on Harki-Pauri at Haridwar. It is further directed that there shall be a total ban of sale, use and storage of plastic carry bags throughout the State of Uttarakhande.f. 01.01.2017. No person shall be permitted to bring carry bags in the State of Uttarakhand by any means of transport, including the bus, trains and air. The State Government shall launch a special campaign to make the people aware to use paper or Jute bags to save the environment. The State Government is directed to ensure that the people should not use soap, oil and shampoo while taking a bath in river Ganga. Bathing of cattle in river Ganga is also banned forthwith. Begging is also prohibited in all the holy places in the State of Uttarakhand. The State Government is directed to provide Skimmers in sufficient numbers to clean Ganga at Haridwar, Rishikesh and downstream. The Forest Research Institute is directed to prepare the fresh D.P.R. for aforestation for the basin and banks of river Ganga. The Municipal Bodies, throughout the State of Uttarakhand, are directed to dispose of the garbage in scientific lines by setting up Treatment Plants, as provided under the Municipal Solid Wastes (Management & Handling) Rules, 2000, within six months. There shall also be a direction not to permit new industries based on water like Sugarcane, Pulp/ Paper Industries, Distilleries, Textile Industries etc. within a radius of two kilometres from the banks of river Ganga. No new commercial establishment employing more than 50 persons including the hotels, having capacity of more than 50 guests, shall be permitted to operate henceforth, without setting up Effluent Treatment Plant or Sewage Treatment Plan. This direction shall also be applicable for big Ashrams housing more than 100 devotees. We recommend/suggest the Union of India to frame the law exclusively for River Ganga to save it from extinction. The Municipal Corporation, Haridwar as well as the Municipal Council, Rishikesh are directed to construct sufficient number of toilets, based on the technology employed in the toilets used in aeroplanes in order to maintain hygiene in the religious places. 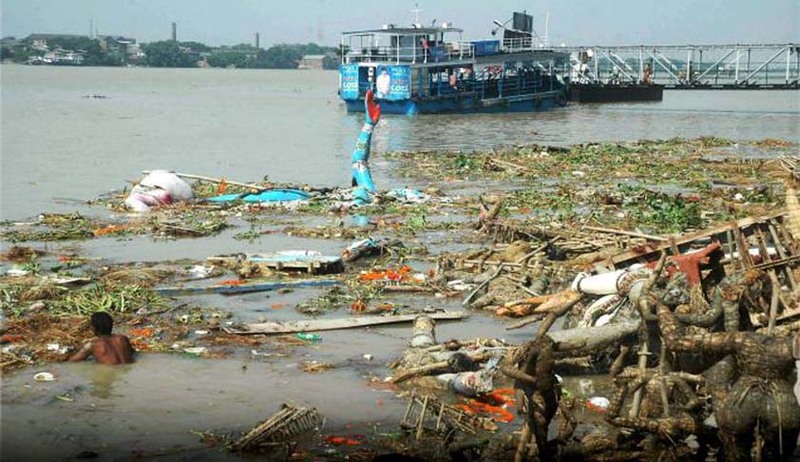 The State Government should declare “River Conservation Zones” where no construction activity should be permitted on the banks of river Ganga from the highest flood plain by private as well as governmental agencies. The Comptroller and Auditor General is directed to conduct a special audit of all the Centrally Financed Schemes launched to rejuvenate river Ganga as well as the amount spent by the State Governments for rejuvenation of river Ganga, within a period of six months and to place the same before His Excellency, the President of India.